Analysis: Williams missed two games in 2018 due to hamstring and toe injuries, finishing the season with 76 tackles (50 solo), 4.5 sacks, one interception and one touchdown. The 29-year-old should again be in store for regular snaps at inside linebacker during the upcoming campaign alongside recent free-agent acquisition Mark Barron. Analysis: Williams finished the 2018 season with 78 tackles -- two behind team leader Sean Davis -- including 4.5 sacks and an interception in 14 games. He experienced some regression from last year, when he totaled 89 tackles including eight sacks. However, he remains an integral piece of Pittsburgh's defense. With three years remaining on his current contract, Williams will return as a starting inside linebacker for the 2019 season. Analysis: Williams was listed as doubtful for Week 17 after sitting out practice all week, so his lack of availability is no surprise. Tyler Matakevich will slot into the starting lineup for Sunday's must-win contest against Cincinnati. Analysis: Williams was unable to practice in any capacity this week after sustaining the toe injury in last week's loss to the Saints. If Williams does miss Sunday's game, Tyler Matakevich would be slotted to start in his place. 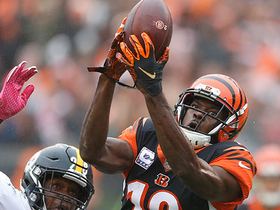 Analysis: The severity of Williams' toe issue isn't fully known, but he'll likely need to make it back to practice by Friday to have a good shot at playing Sunday against the Bengals. Williams has suited up in 14 of the Steelers' 15 games to date and has tallied 76 tackles, 4.5 sacks, an interception and a touchdown. 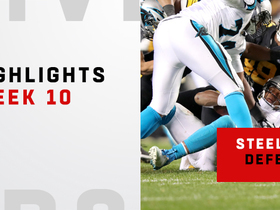 Analysis: It appears Williams sustained this injury during Week 16's game versus the Saints, when he posted five solo tackles. The Steelers are in must-win territory, so they'll benefit greatly if their starting inside linebacker can shake his injury before the season finale versus the Bengals. Williams had just one tackle (solo) during Sunday's 24-21 loss to Oakland. Analysis: Entering the contest as the team leader, Williams had his fewest tackles in a game since 2016. With 68 tackles on the season, he now trails Sean Davis by one. He'll look to reclaim the top spot on defense against the Patriots in Week 15. In the 2017 meeting against New England, Williams had three tackles and an interception. Williams totaled three tackles (all solo) including a sack during Sunday's 24-17 loss to Denver. Analysis: Pittsburgh entered the week with the fifth best defense in the league in terms of yardage allowed (326.8 per game) and held the Broncos to just 308 yards from scrimmage, but it wasn't enough to earn the win. Williams has been an integral part of that defense and now has 62 tackles this season, second only to Jon Bostic (66) on the team. He'll look to add to that total in Week 13 against the Chargers. Williams recorded 10 tackles (six solo) including a sack during their 20-16 win against Jacksonville. Analysis: The 10 tackles were the most in a game for Williams since Week 1, and he has now been involved in sacking opposing quarterbacks in four of his last five games. Pittsburgh has a six-game winning streak during which the defense has held opponents to 21 or fewer points in each game. They face Denver -- which averages 23 points per game -- in Week 12. Williams recorded four tackles (three solo), including a sack, and returned an interception for a touchdown during Thursday's 52-21 win over Carolina. 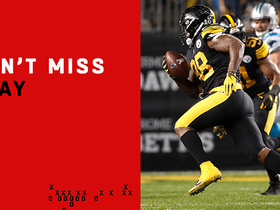 Analysis: Williams came up with a huge play on a pick-six to give the Steelers their first lead of the game. 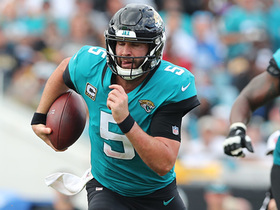 Two drives later, he took down Cam Newton, giving him 1.5 sacks in the past two weeks. He'll look to add to that total in Week 11 against Jacksonville, which has allowed 22 sacks this season, including 16 in its last four games. Williams had four tackles (three solo) including a half sack during Sunday's 23-16 win over Baltimore. Analysis: Although he is among the team leaders in tackles, Williams has managed just 1.5 sacks this season, a huge drop from the 11.5 sacks in recorded in 2017. While Pittsburgh's defense has played well as a whole, Williams has been a bit of a disappointment. The Steelers play on Thursday in Week 10 and lead the series against the Panthers 5-1-0, winning the last five meetings. Williams led the defense with seven tackles (six solo) including a sack during Sunday's 28-21 win over Cincinnati. Analysis: The Steelers had three sacks in the game including the first of the season for Williams, who had a career-high eight sacks last year. He also has 36 tackles to trail Jon Bostic by one for the team lead heading into a Week 7 bye. Williams (hamstring) was a full participant at Wednesday's practice, Teresa Varley of the team's official site reports. Analysis: Williams' practice without limitation suggests he's in line to play in Sunday's game against the Bengals. Barring any setbacks, Williams figures to slide back into his role at starting inside linebacker. Williams (hamstring) is inactive for Sunday's Week 5 tilt against the Falcons. Analysis: The Steelers will be without one of their starting interior linebackers against the high-powered Falcons offense, which will commemorate the return of Devonta Freeman to action following a knee injury. Williams (hamstring) is considered doubtful for Sunday's game against the Falcons, Teresa Varley of Steelers.com reports. 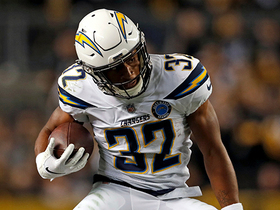 Analysis: Williams was unable to practice all week after suffering a hamstring injury during Sunday night's loss to the Ravens. His potential availability for Week 5 doesn't look too promising, so a combination of L.J. Fort, Matthew Thomas and Tyler Matakevich could see additional snaps at inside linebacker next to Jon Bostic. Williams (hamstring) did not practice Thursday, Chris Adamski of Triblive.com reports. Analysis: Williams suffered a hamstring injury during Pittsburgh's Week 4 loss to the Ravens and has not participated in practice since. The starting linebacker should be considered questionable for Sunday's game against the Falcons, and if Williams were to miss any time, it would mean an uptick in snaps for L.J. Fort, Tyler Matakevich and Matthew Thomas. Williams recorded 12 tackles (four solo) across 88 defensive snaps in Sunday's 21-21 tie with the Browns. Analysis: Williams got off to a solid start Sunday, recording a double-digit tackle count for the first time since Week 4 of the 2016 season. He'll look to keep up the level of play Sunday against the Chiefs and their high-flying offense. Williams re-signed with the Steelers on Thursday, Teresa Varley of the team's official site reports. Analysis: Williams has made his love for the city of Pittsburgh abundantly known and it paid dividends Thursday. The four-year deal will keep Williams in the Steel City through the 2021 season. Since 2013, Williams has recorded 10.5 sacks and 244 tackles with the Steelers. 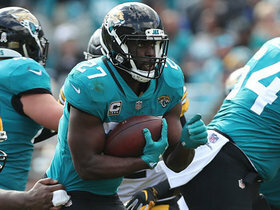 Williams cleared the league's concussion protocol and will be eligible to return to Sunday's game against the Jaguars, Ed Bouchette of the Pittsburgh Post-Gazette reports. Analysis: Williams was taken to the locker room during the first half of Sunday's tilt after suffering the head injury, but he'll likely be back in action following halftime. Williams is being evaluated for a possible concussion and his return to Sunday's game against the Jaguars is considered questionable. Analysis: Williams, who posted a career-best 89 tackles during the 2017 regular season, was escorted to the locker room in the first half of Sunday's contest after suffering a head injury. Williams may be able to return to the game if he clears the league's concussion protocol, but L.J. Fort and Tyler Matakevich could see increased roles at inside linebacker. Williams, who recorded four tackles (three solo), including a sack in Sunday's win over the Browns, finishes up the 2017 season with 89 tackles (69 solo), including eight sacks in 16 games. Analysis: This year was Williams' best by far, after totaling just 2.5 sacks in his previous four seasons. The Pittsburgh defense, which allowed just 19.3 points per game, will be a huge factor in how far the team advances in the post season. Williams totaled three tackles (all solo) and an interception in Pittsburgh's 27-24 loss to New England on Sunday. Analysis: The fifth-year linebacker intercepted a Tom Brady pass intended for Rob Gronkowski that set-up a touchdown five plays later for a 24-16 lead. However, the Patriots scored 11 unanswered points in the fourth quarter for the come-from-behind win, ending Pittsburgh's eight-game winning streak and gaining the inside track for home field advantage in the AFC playoffs. Williams totaled nine tackles (four solo) and a sack in Monday night's win over the Bengals. Analysis: The tackle total is Williams' highest of the season, and the sack is his seventh of the year. The 27-year-old will hope to keep things rolling against Joe Flacco and the Ravens in Week 14. Williams recorded nine tackles (four solo), including a sack in Pittsburgh's 23-20 win over Cincinnati on Monday. Williams recorded seven tackles (six solo), including a sack, in Thursday's 40-17 win over the Titans. Analysis: With 54 tackles, including six sacks, Williams is second on Pittsburgh's defense to Ryan Shazier (79) and Cameron Heyward (seven) in those respective categories. With six games remaining, he's already established new career highs in both, making him a surprising IDP star. In Week 12, the Steelers host the Packers, a team they haven't faced since Williams' rookie season in 2013. 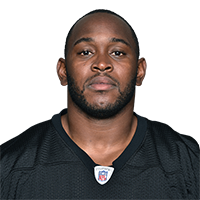 Williams had five tackles (four solo), including a sack in Pittsburgh's 20-17 win over Indianapolis Sunday. Analysis: Not so quietly, Williams is having the best season of his career, recording a sack for a second straight game, giving him five to share the team lead (Cameron Heyward). He'll look to add to that total in Week 11 against the Titans, who allowed four sacks in Week 10. 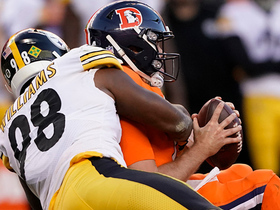 Pittsburgh Steelers linebacker Vince Williams drops Denver Broncos quarterback Case Keenum for a first-down sack and a loss of six yards. 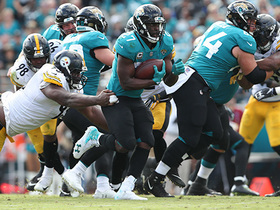 Pittsburgh Steelers linebacker Vince Williams stops Jacksonville Jaguars running back Leonard Fournette to force fourth down. 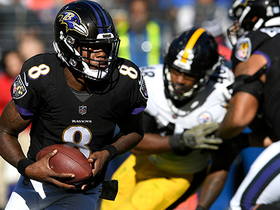 Pittsburgh Steelers rookie linebacker T.J. Watt forces near turnover by Balitmore Ravens rookie quarterback Lamar Jackson. 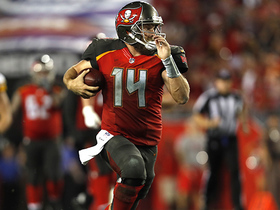 Tampa Bay Buccaneers quarterback Ryan Fitzpatrick scrambles for 17 yards against the Pittsburgh Steelers for Week 3 of the 2018 season.